Safaricom has been looking to improving customer care for its customers. During the announcement of HY 2016 financials, the company said it was looking to implement big data solutions with such a solution will allow the telco derive value from customer sentiment from platforms such as Twitter, Facebook and even calls. Safaricom further plans to reduce the number of calls to the call center by continually offering customers guided steps towards resolving most of their queries by customers. The firm also recently allowed customers to access monthly statements free of charge via email. Customers will also have the option of requesting for automatic monthly statements every 5th day of the month thereby enhance transparency and accountability for users of the service. 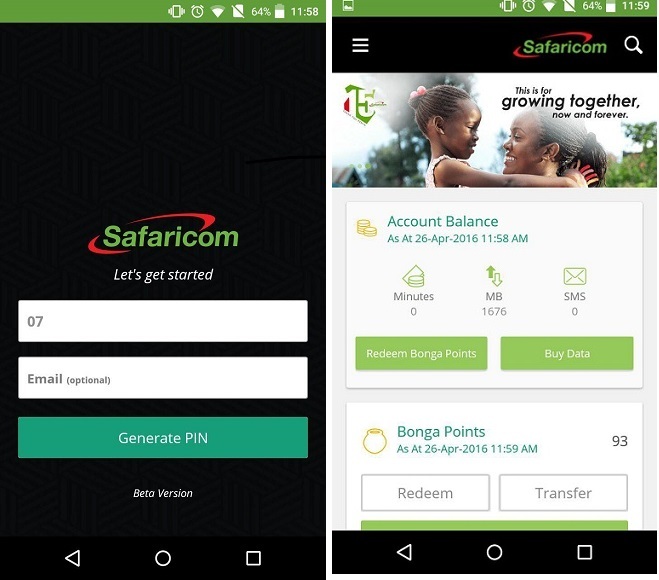 The firm has now released an app called My Safaricom, that only mirrors the users account but incorporates important shortcuts for a user. The app also features self care features to allow a subscriber resolve any issues they may have. The App is available on the Google Playstore and upon download, asks for your name and email address. One then receives a Pin number to login via SMS. Upon signing in, one views their account balance for sms, data bundles and airtime. It also offers shortcuts to redeem or transfer bonga points. Users can also use the app to purchase data bundles. On clicking on the left tab, a user can view a whole range of options from a store locator to knowledge base on Safaricom services as well as my services, which incorporates commonly used Safaricom features by a subscriber. We shall definitely review the app and tell you what we think. In the meantime check out the App on the Playstore. Hello my name is Benson my phone has a problem that I can make a call but people can’t reach and the phone is on . What could the problem?